Archaeologists working at Omrit have revealed the discovery of an Assyrian seal from the reign of Sargon II. The story is reported at Haaretz and on Ferrell’s Travel Blog. The remains of 50 mummies from the New Kingdom period have been discovered in the Valley of the Kings in Luxor. Former Egyptian antiquities minister Zahi Hawass is under investigation for illegally amassing a fortune of $14 million. The pillaging of Syria’s antiquities is now a full-time business for some. The Christian Science Monitor talks to some of those involved. Is the Abba cave in Jerusalem the burial place of the last Hasmonean king? Haaretz presents the case for this identification. Joe Zias rejects it. There’s a new open-access journal of interest: Science and Technology of Archaeological Research. The editors are looking for submissions. Accordance has a new series of 6 introductory Bible atlases published by Carta (OT, NT, archaeology, kingdoms, people, geography). For the first week only, the price is reduced to $79.99. The Black Obelisk of Shalmaneser III was made in c. 827 BC in ancient Assyria. It is about six and a half feet tall and a full photo is shown to the left. 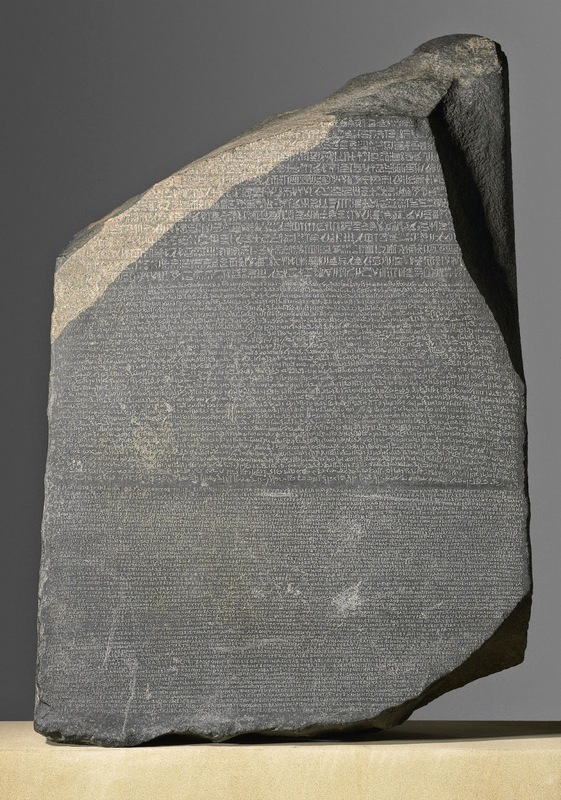 It is made of fine grained black limestone and it refers to both King Jehu and King Omri. These Israelite kings are also referred to frequently in the Bible (cf. 1 & 2 Kings). 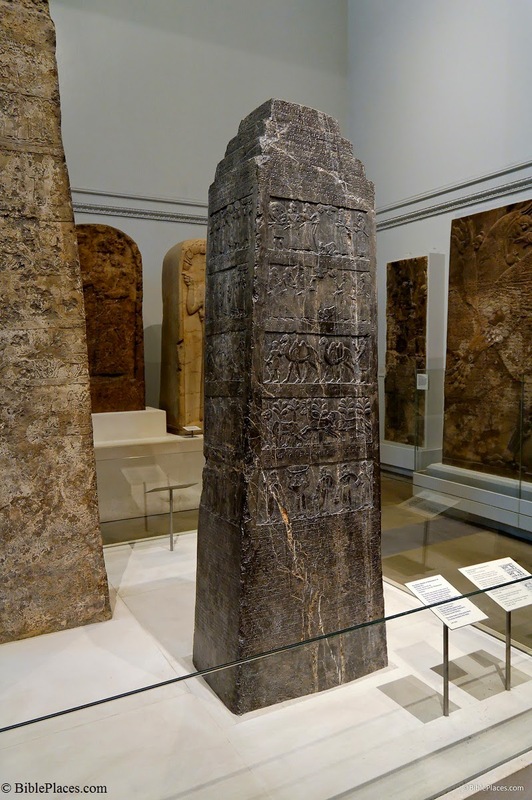 The obelisk was found in 1846 in Nimrud (ancient Calah) and is now on display in the British Museum. The obelisk has the overall shape of a ziggurat with the top being finished with narrowing stepped platforms. Each of its four sides has 5 panels that show individuals bringing tribute to Shalmaneser. The inscriptions tell of Shalmaneser's military victories and cover 31 years of his reign. The following photo is a close-up of one of the panels showing an Israelite (either King Jehu or an emissary) bowing to the king of Assyria. 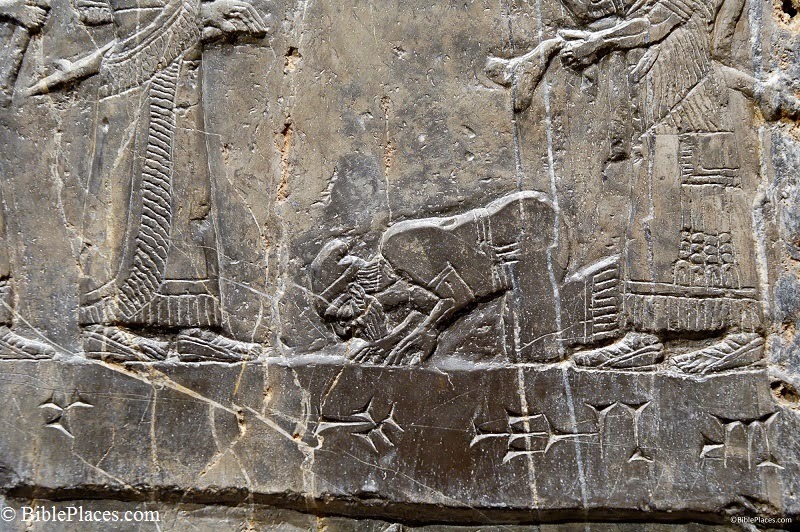 The cuneiform text reads: "Tribute of Jehu, son of Omri...."
Of interest to Biblical studies is the fact that Jehu apparently decided not to resist the Assyrians as one of his predecessors, King Ahab, had decided to do as previously noted at this post Kurkh Monolith. Instead of resistance, he decided to bring tribute and make peace for which he likely received the protection of Assyria from his nearby foe, Hazael of Damascus. Within a few years, however, it would become abundantly clear that Jehu had made a poor choice (cf. 2 Kgs 10:32-33). In my experience, the most important area of the biblical land that people know the least about is the hill country of Samaria. Its importance is reflected in the fact that it is easier for me to list biblical people who were not in this area than it is to name those who were. Why is this region generally less known? Most tour groups avoid it. Yes, it is possible to come to Israel and not see Shechem, Samaria, Shiloh, and Ai. In fact, I would estimate that 95% of tourists never see these major sites. I can’t recommend a tour group that will take you there (though if any tour operators would like to recommend a tour, they are free to do so in the comments below). But I can suggest you watch a short video that will help you to understand this region and its historical significance. The video includes a historical review of major events, including Jacob’s dream at Bethel, Joshua’s battle at Ai, the tabernacle at Shiloh, Jeroboam’s capital, Baal worship at Samaria, the chariots of fire at Dothan, and the Samaritan woman at Jacob’s well. Photos and on-location video bring the area to life. This video and others in the series are produced as commentaries for the Satellite Bible Atlas, but the atlas is not necessary to understand the videos. The video was created by Bill Schlegel and includes clips of some of his friends and students. It also makes good use of photos from the Pictorial Library of Bible Lands, volume 2. 15 minutes gets you a great education on this most important biblical region. For best results, play the video in full screen and change the quality to HD. Syria is trying to attract investment in tourism. Aleppo, Crac des Chevaliers, and Palmyra are not accessible, but other places are perfectly safe, according to the minister of tourism. Israel’s Ministry of Tourism plans to increase the number of campgrounds around the country. Nazareth will be the title of a new miniseries produced by Fox about the years Jesus spent growing up in this Galilean village. The Bible records nothing of this period in Jesus’ life. Leen Ritmeyer provides some corrections to the story about the Temple Mount chisel. Archaeologists working in southern Egypt have discovered two tombs, including one with “a trove of artifacts including reed pens and a bronze inkwell.” They date to about 600 BC. A cave with human remains from the first century was discovered near Ein Tzurim south of Bethlehem. Bruce Chilton revisits the issue of the authenticity of the James Ossuary. Paleojudaica reflects on the latest developments with the Gospel of Jesus’ Wife. Bible History Daily has a much more thorough review. Publications of the Oriental Institute, 1906-2014: Exploring the History and Civilizations of the Near East. Edited by Thomas G. Urban and Leslie Schramer, compiled by Zuhal K. Sharp. Chicago: The Oriental Institute, 1991, 2014. Second revised edition. 28 pages (more than 750 titles). All titles published by the Oriental Institute, with active links to their web pages, alphabetically arranged. The Final Days of Jesus is available today for Kindle for $0.99. The weekly ASOR roundup is here. Two days ago, we highlighted the brand-new maps which are included in the revised Pictorial Library of Bible Lands. Today, we will illustrate some of the steps involved in creating the maps. The key to making a map is layers. One layer contains all the dots and names of sites; another layer includes rivers and wadis; the terrain is yet another layer; and so forth. Each of these layers of data has first to be created or obtained from somewhere, and then they are compiled into a map. 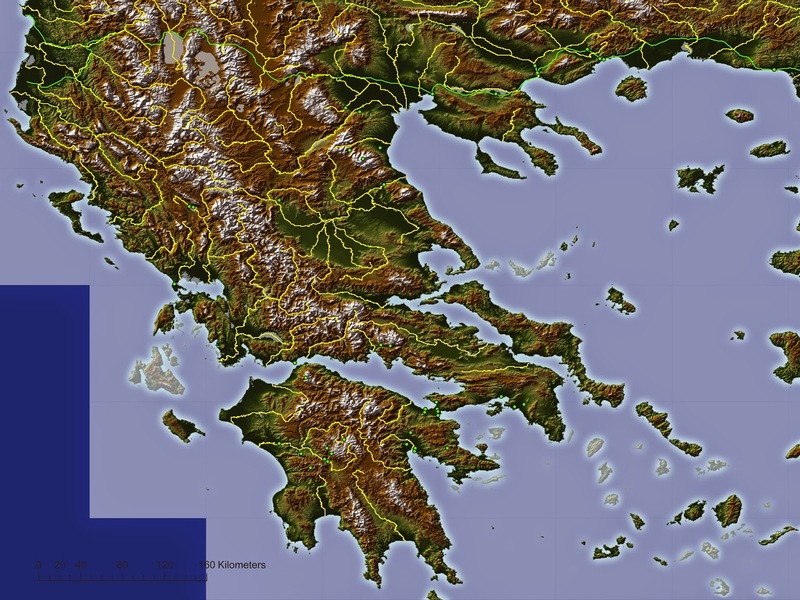 The base maps are created from a DEM, or digital elevation model. A DEM is like a digital photograph from your camera, except each pixel records an elevation. (In this case, the DEMs come from NASA.) From this one DEM, two separate images are generated: one image which shows a continuous color gradation from dark-to-light (showing elevation change), and a second image which shows "hillshading," that is, the shadows that would be cast if the sun were in a particular position. a continuous progression from dark to light colors. 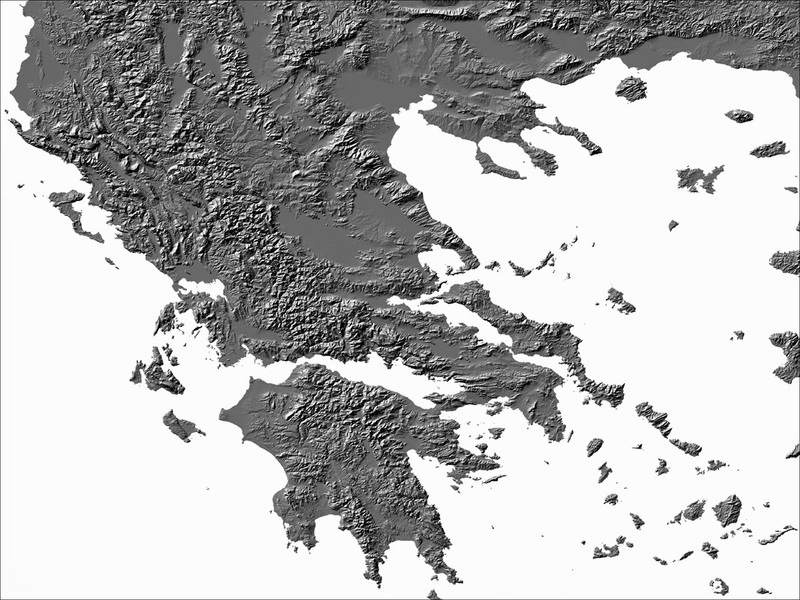 Hillshading effect applied to the DEM of the Balkan Peninsula. The first image was colorized according to the scheme used for the Pictorial Library maps. Then, the sea was colored blue. Grayscale hypsometric tint replaced with color hypsometric tint. Colorized sea with coastal "glow." Finally, these two images were blended into one image to complete the base map. Hypsometric tint and Hillshade blended. After the base map is completed, it remains to add all the streams, lakes, sites, and other lines and dots that make up the map. The linework and dots began by looking like this. Linework and dots to be added to the map. Linework and dots overlaid on the base map. The final step is to "clean up" all the lines and dots and add name labels. The linework is given the right colors, widths and sizes, and any unnecessary elements are removed. 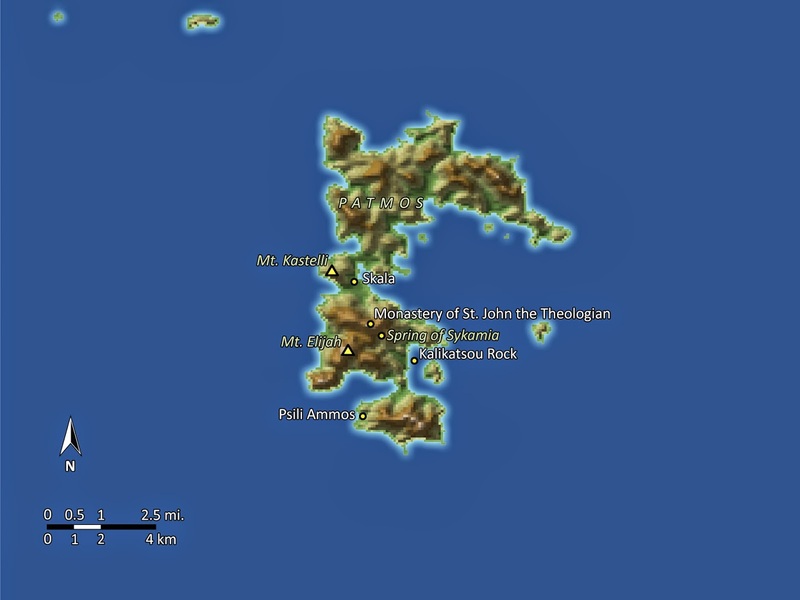 The final map comes out like this. The Jerusalem maps are special. The base map that was used comes from the Ordnance Survey of Jerusalem, by Sir Charles Wilson. The map was scanned, and then colorized by Bill Schlegel. We added the pools, lines and labels. 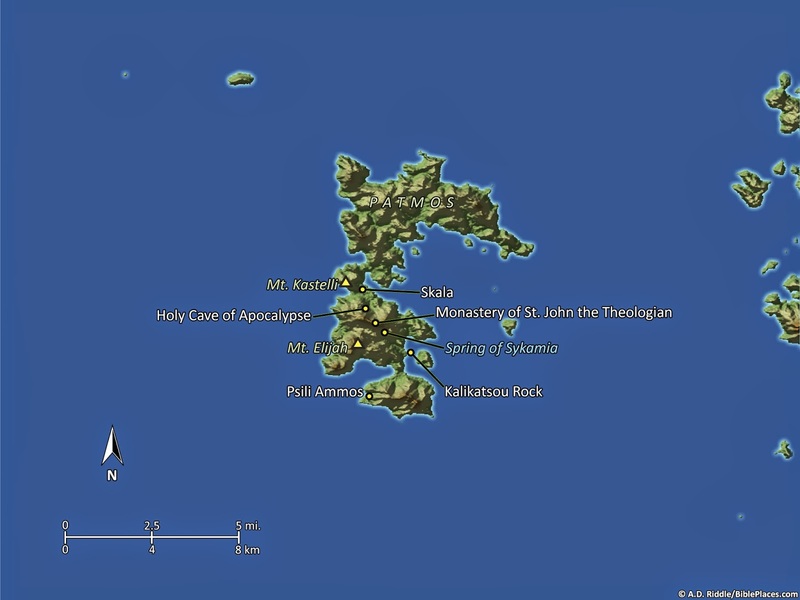 As a final note, when the revised Pictorial Library of Bible Lands was first released, we were not able to include a map of the island of Patmos, because the resolution of the NASA data was too coarse--the island is simply too small. Here is what it would have looked like. 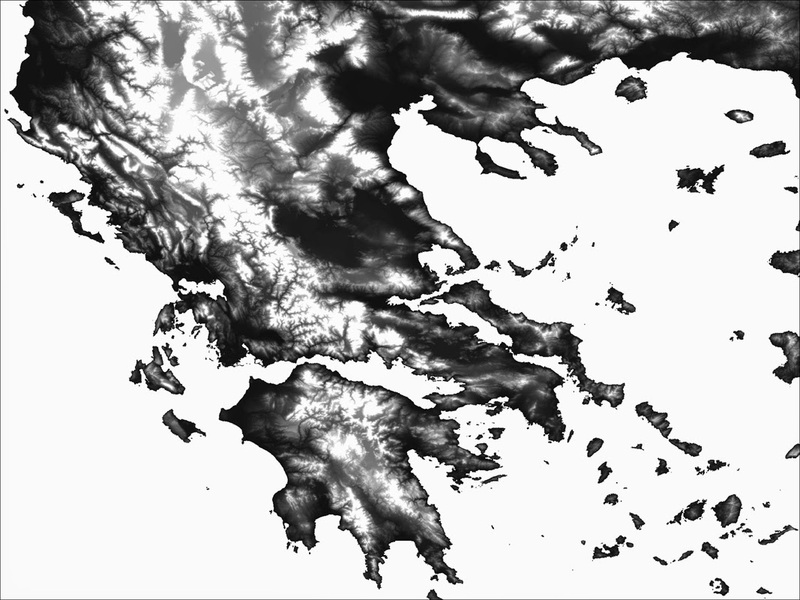 Ugly map of Patmos (not in PLBL) using NASA SRTM data. Pixel resolution is 3-arc seconds, i.e. each pixel covers an area 90 meters by 90 meters. Since then, we have obtained higher resolution DEMs from NASA (via the Oriental Institute's CAMEL Lab). 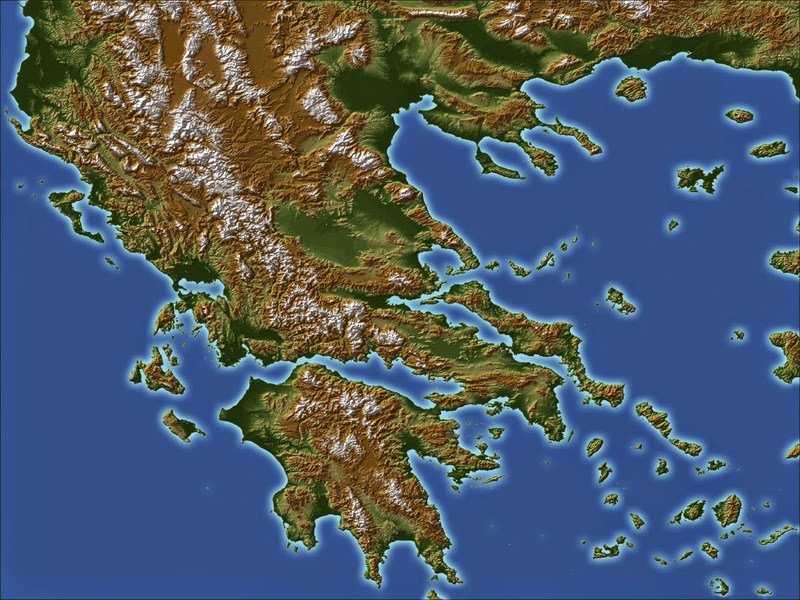 The resultant map looks much better and now is fit to be included in the PowerPoint for Patmos, in Volume 12 "The Greek Islands" of the Pictorial Library. 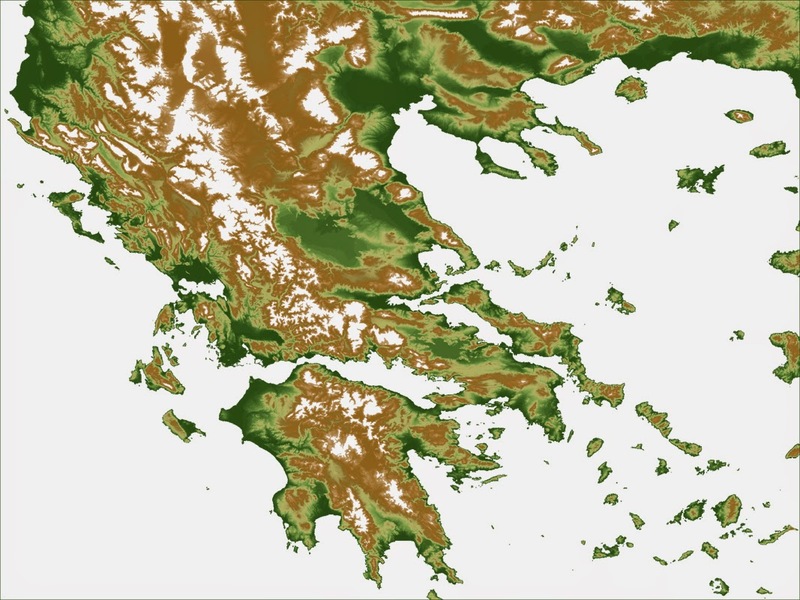 Handsome map of Patmos using NASA ASTER GDEM data. Pixel resolution is 30 meters. In our next post, we will highlight another brand-new feature which was added in the revised edition of Pictorial Library of Bible Lands. As with the maps, it makes the thousands of photographs in the collection more accessible and enhances their usability. Archaeologists excavating in the area below Robinson’s Arch along the southern end of the Western Wall of the Temple Mount have discovered a metal chisel used to shape the stones in the first century. The Israel Antiquities Authority has not issued a press release yet, but Haaretz has learned of the discovery. Archaeologists have found a stonemason's chisel that they believe may have been used by the builders of the Western Wall in Jerusalem. Actually Eli Shukron, an archaeologist working for the Israel Antiquities Authority, found the chisel last summer while digging at the lower base of the Western Wall, south of the Western Wall courtyard. However, the IAA has preferred to remain silent on the discovery, based on the need to study the tool and other evidence further before issuing any statements, it explained. Shukron has been digging in the area of the City of David and the Western Wall together with Prof. Ronny Reich for the past 19 years, until a few months ago. 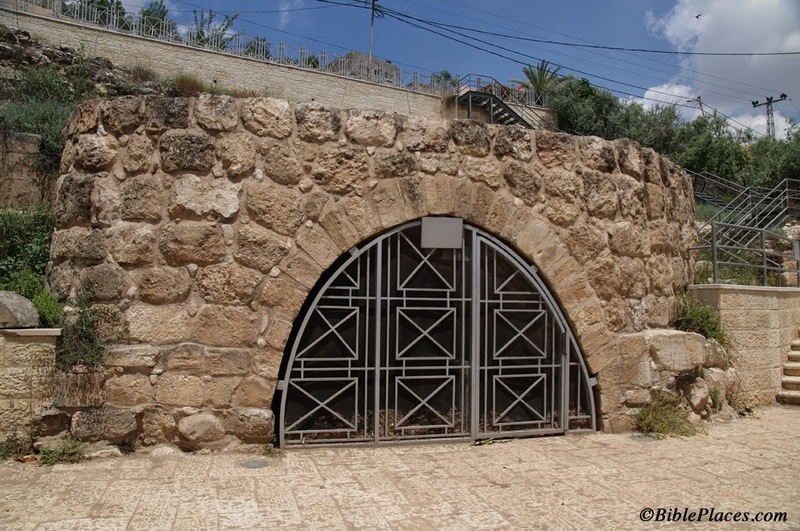 In recent years Shukron had been excavating inside a tunnel found to lead from the City of David into the Old City, passing beneath its massive stone wall and ending at the Western Wall. The chisel is just one of many archaeological treasures that Shukron and Reich reported from the area. Other finds include a Roman sword, cooking vessels from the period of the Great Rebellion, a gold bell that they think may have adorned the robe of the High Priest, and a ceramic seal apparently used to confirm the suitability of sacrifices brought to the Temple. "People pray and kiss these holy stones every day, but somebody carved them, somebody chiseled them, somebody positioned them," Shukron says. "They were workers, human beings, who had tools. Today for the first time we can touch a chisel that belonged to one of them." The full article in Haaretz (registration/subscription required) explains the basis for dating the construction of the Western Wall of the Temple Mount to one of the rulers after King Herod. The Pictorial Library of Bible Lands is an extensive collection of high-resolution photographs. The photos come two ways: in folders of jpeg images and in pre-made PowerPoint presentations. With the massive revision of the collection some brand new features were included which were not in previous versions, and I would like to highlight two of them. The first of these new features is maps which are included in each PowerPoint presentation. The Pictorial Library contains all the familiar sites, but it also has many biblical and historic sites that are not as well known. The maps are provided to help the user find where a site is located, without having to consult a separate source. Virtually every site and geographic feature which appear in the Library's photographs are marked on the maps. 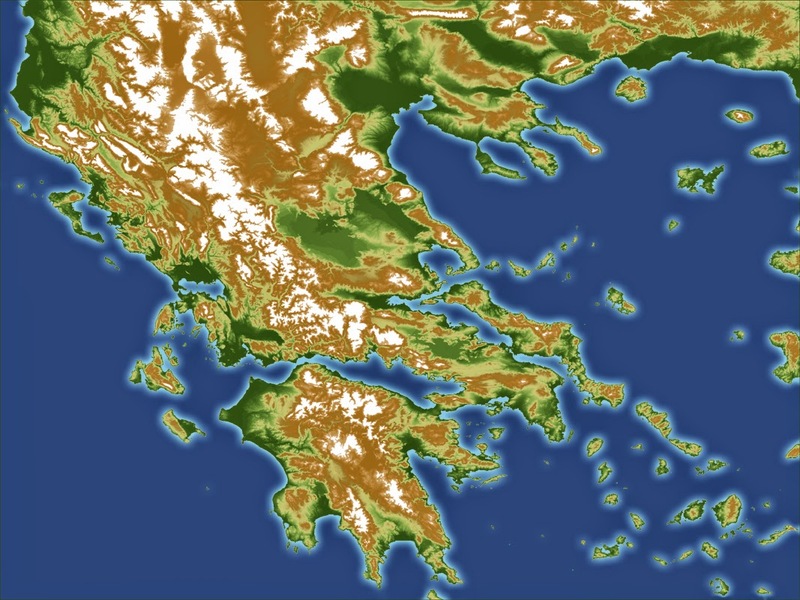 This results in maps with a mixture of both modern place names and ancient ones. The places which appear in any given PowerPoint are marked by a red star on the map(s) next to the name so that users can quickly locate that particular site or feature. The maps use two color schemes to encode information: one scheme for hypsometry and one scheme for labels. First, lower elevations are colored green, intermediate and higher elevations are colored various shades of brown, and the highest elevations are colored white. This is called hypsometric tint, where the change in color represents change in elevation. Green does not necessarily represent areas with vegetation, brown does not necessarily represent arid regions, and white does not necessarily represent snow. Second, the labels and linework also have a color scheme. The white labels are used for cultural features, that is, features which have been created by human beings, such as settlements, tumuli, or temples. 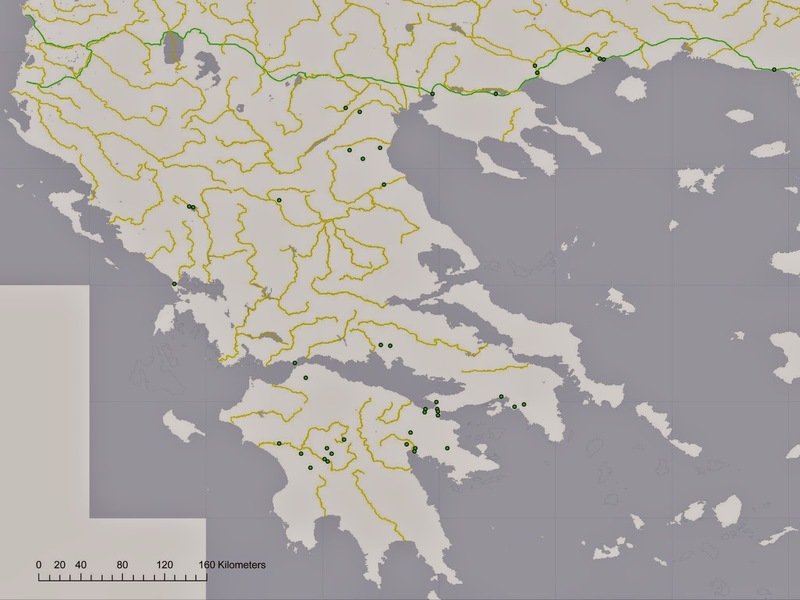 Yellow labels and lines indicate routes, either natural or man-made; green labels indicate geographical features (plains, valleys, mountains); and blue labels indicate water features (rivers, lakes, springs). The yellow dots indicate cities, springs, or other sites such as aqueducts or tumuli. 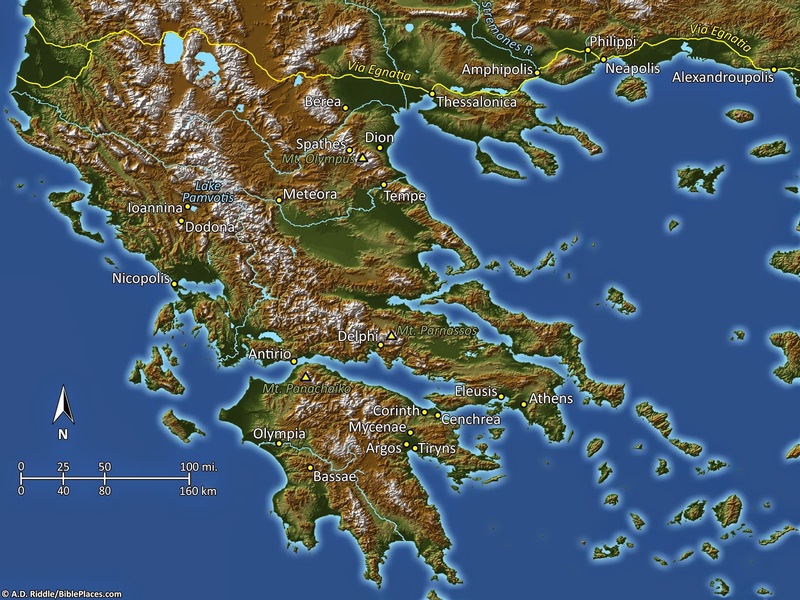 One thing that cartographers have to consider is changes in coastlines and lakes over time. Will the map represent a historical state, the modern one, or perhaps a mixture of both? 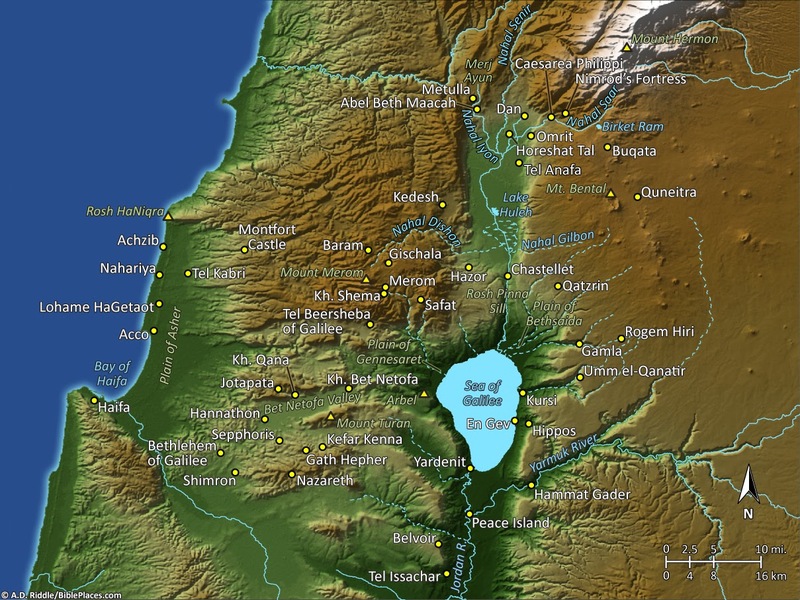 The maps in the Pictorial Library of Bible Lands show the modern coastline and the modern Sea of Galilee and Lake Huleh. But the shape of the Dead Sea, as with the majority of maps of Bible lands, dates to 1975 and before. If we had used the modern shape of the lake, only the northern basin would be blue, because today the southern basin is dry due to lowering of the lake level. The maps are an important new feature in the Pictorial Library of Bible Lands and are one of the ways in which we have tried to make the collection more user-friendly. In a follow-up post, we will describe some of the steps in the map-making process. Galilee map, PLBL vol. 1. Aren Maeir will be lecturing on the Philistines in Kansas City and Chicago later this month. Israeli police arrested five Jews attempting to sacrifice a goat at the Temple Mount for Passover. A couple of tombs from the 26th Dynasty were discovered in Pr-Medjet. Luxor Times has photos. The ruins of Palmyra have suffered from the Syrian civil war, and the New York Times provides an update. The ASOR roundup has more stories from archaeology around the world. Bibles-Online is a new site that allows you to view every page of rare and antique copies of the Scriptures, including the 1521 Erasmus Greek NT, the 1535 Coverdale Bible, the 1549 Matthew-Tyndale Bible, and others. Wayne Stiles is offering a significant discount on his new audiobook this weekend before it is available at Audible.com. I’ve highly recommended the print version of Walking in the Footsteps of Jesus in the past and now the audiobook is available for less than $7. The site of Khirbet Bal'ama (or Belameh) is identified with ancient Ibleam, mentioned in the account of Jehu's coup d'état (2 Kings 9:27) as well as in Thutmosis III's topographical list at Karnak. Khirbet Bal'ama is located on the southern outskirts of Jenin, in the West Bank. The ancient ruins occupy some 9 hectares (22 acres) on top of a 160-foot-high (50 m), natural limestone hill. A walled town existed in the Early Bronze, Middle Bronze, end of Late Bronze/early Iron I, and possibly Iron II Ages. The main spring was located at the northeast foot of the hill. Here, early explorers visited the entrance to a water system, though because of bats and debris/wash only a small part of a tunnel could be accessed. 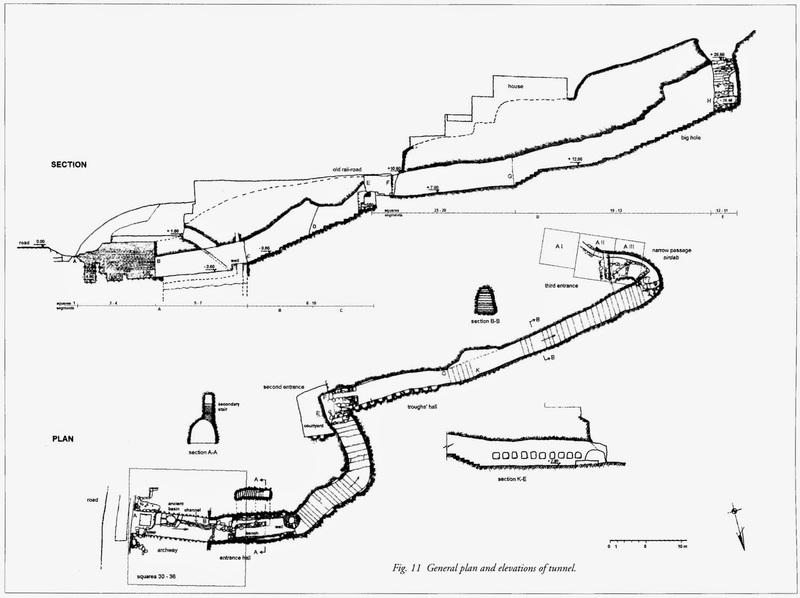 About the first 100 feet (30 m) of the tunnel were described in great detail by Gottlieb Schumacher in 1910, and it was excavated in 1973 on a small-scale by Z. Yeivin. The main excavation of the tunnel took place in 1996 and 1997 under the direction of Hamdan Taha. (Excavations were also conducted on top of the hill, but publication is still forthcoming.) 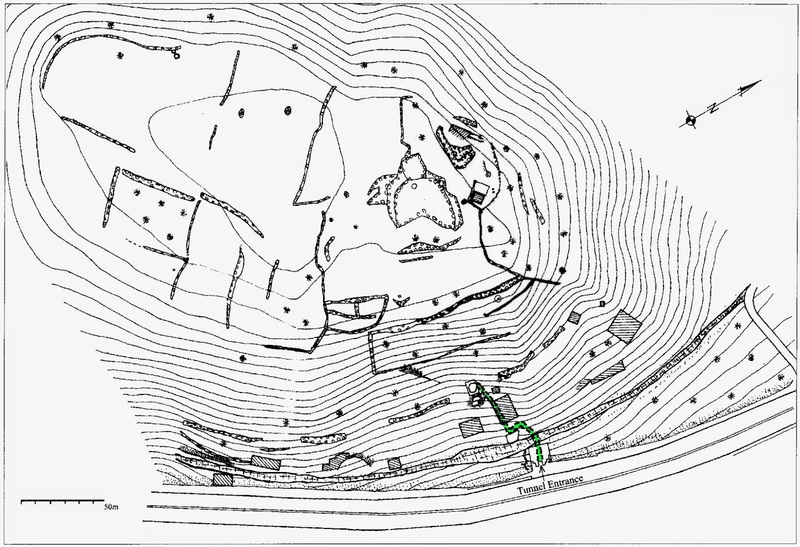 The location of the tunnel is marked in green on this site plan. What raised my interest in this were reports the last two years of the water system outside Al-Walaja, near Bethlehem. In three seasons, the excavators at Khirbet Bal'ama cleared a total of 380 feet (115 m) of tunnel, but since they did not reach a shaft-entrance at the top of the hill, they suspect a long section of tunnel remains to be explored. Of the tunnel sections which were excavated, archaeologists discovered three entrances to the tunnel, the lowest of which provides access to the cistern/spring of Bir es-Sinjil (or Sinjib). The photo below shows the lowest entrance. The stairs with metal handrails on the right lead up to the second entrance. Lowest tunnel entrance at the cistern/spring of Bir es-Sinjil. The tunnel was apparently constructed in the Iron Age, though this is based largely on inference rather than clear, direct evidence. It was secondarily used in the Hellenistic and Roman periods. The cistern/spring was in use all the way up to the modern period. Nearly all of the explored tunnel is rock-cut. The tunnel has a parabolic ceiling between 10 and 16 feet high (3-5 m), and there are 57 rock-cut steps and lamp niches in the walls. The plan below shows the three entrances, steps, and slope of the tunnel. The three excavated entrances are approximately equidistant from one another, with about 100 feet (30 m) of tunnel between them. Taha, Hamdan and Gerrit van der Kooij. 2007 The Water Tunnel System at Khirbet Bal'ama. Khirbet Bal'ama Archaeological Project Report of the 1996–2000 Excavations and Surveys, volume II. Ramallah: Ministry of Tourism and Antiquities, Department of Antiquities and Cultural Heritage. 2000 “Excavation of the Water Tunnel at Khirbet Belameh, 1996-1997.” Pages 1587–1613 in Proceedings of the First International Congress on the Archaeology of the Ancient Near East, Rome, May 18th-23rd 1998. Ed. P. Matthiae and E. Enea, Alessandra. Rome: Università degli studi di Roma "La Sapienza," Dipartimento di scienze storiche, archeologiche e antropologiche dell'antichità. 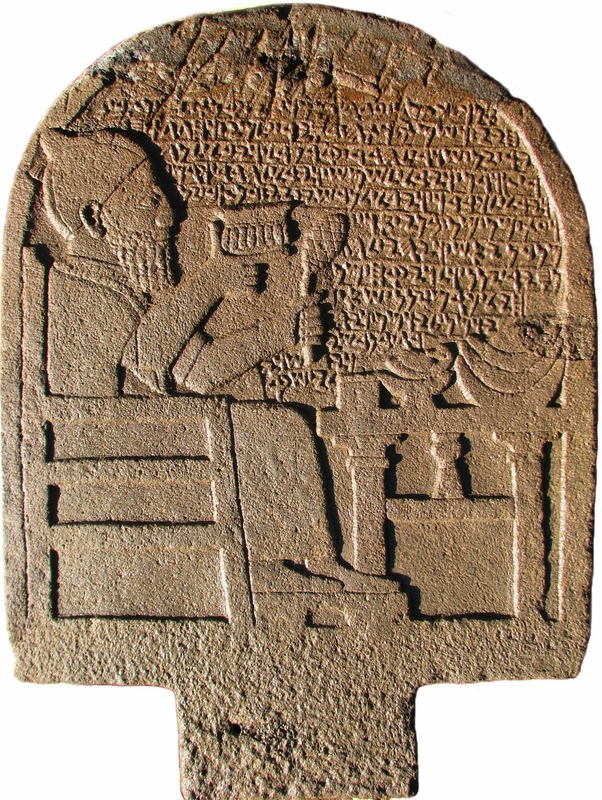 A few weeks ago, it was announced that cuneiform texts in the Israel Museum have been added to CDLI, the Cuneiform Digital Library Initiative. I would like to draw attention to two of these inscriptions that should be of interest to teachers and students of the Bible. The first is the Iran Stele, a limestone stele of Tiglath-pileser III which is preserved in fragments that were found in western Iran. The stele depicts the king and symbols of deities, and the inscription records the king's annals, including a report that he imposed tribute upon (among others) king Menahem of Samaria (2 Kings 15:19). The second is the "Jerusalem Prism" of the Assyrian king Sennacherib. Sennacherib recounts his campaign to Sidon, Philistia, and Judah in 701 B.C. He reports how he defeated the Egyptians at Eltekeh and Tamna (2 Kings 19:9), reinstalled Padi as king of Ekron, and then conquered many of Judah's towns while confining Hezekiah to Jerusalem like a caged-up bird (2 Kings 18-20). Sennacherib recorded the account of this campaign on several other prisms and cylinders like this one, such as the Taylor and King Prisms and Rassam Cylinder (British Museum) and the Chicago Prism (Oriental Institute). 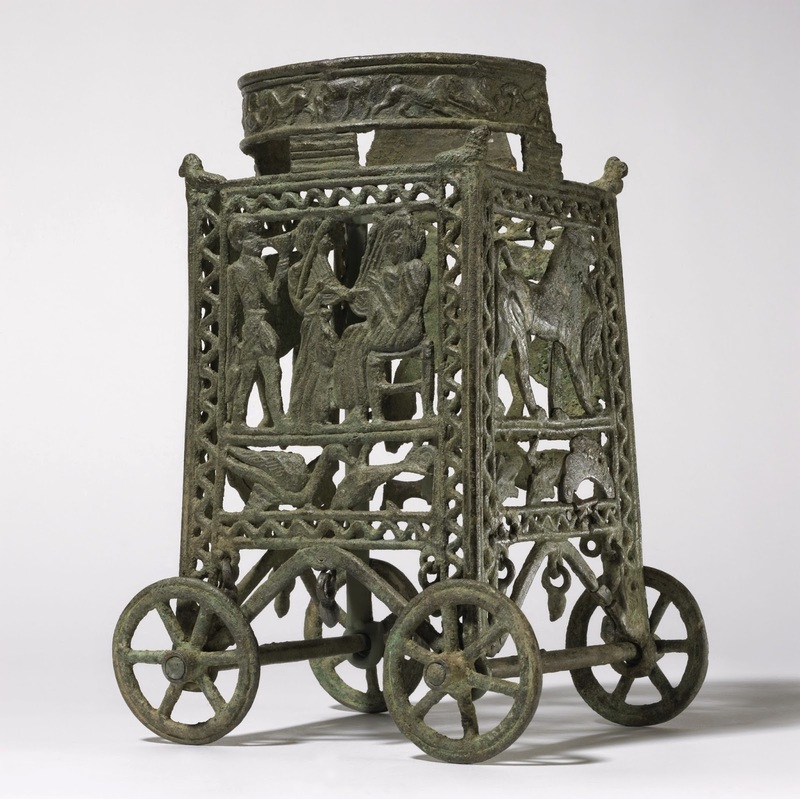 Readers may also be interested in the British Museum's free Image Service, which is not new. Once you search the museum's online collection for the item in which you have an interest, you will be able to see if there are photographs available. After clicking on the thumbnail, you can enlarge the photo or see if there are "More Views" available. Below the photograph, there should be a link "Image service: Use image." This link will take you to a page where you can register or sign-in to the Image Service and request the photograph. The website will ask you to select how you intend to use the photograph; options include "Classroom or teaching material" and "Private or professional study or research (without print publication)." Once you submit the request, the photograph will be emailed to you within a day or two. The stated limit is 100 images per month. I successfully requested about a dozen images in one sitting for use in a classroom PowerPoint. 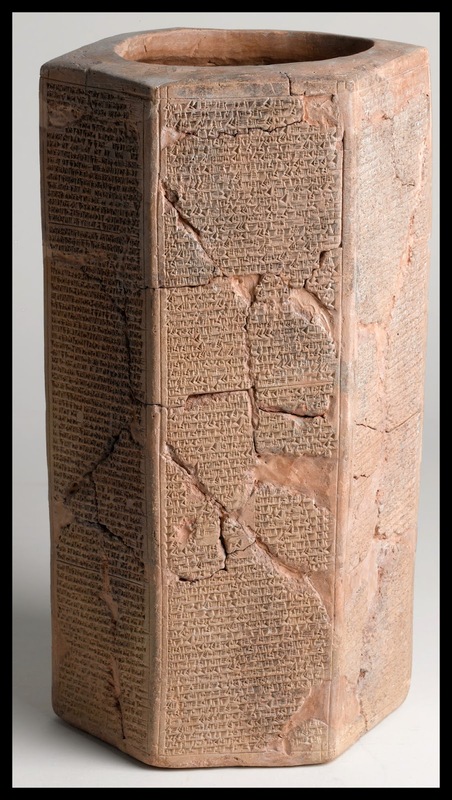 Objects one might wish to use in teaching could include: Enuma Elish, Atrahasis, Epic of Gilgamesh, Lachish Reliefs, Rosetta Stone, Black Obelisk, Kurkh Monolith, Taylor Prism, Armana letters, and Lachish letters. One could search for the name of a king from Assyria or Egypt or Rome, or a particular type of object such as coins, lamps, papyri, and so forth. Fant, Clyde E., and Mitchell G. Reddish. 2008 Lost Treasures of the Bible: Understanding the Bible through Archaeological Artifacts in World Museums. Grand Rapids: William B. Eerdmans. Oxford University Press: "To celebrate National Library Week (April 13th – 19th 2014) and all the hard work librarians do to support their patrons, OUP is freeing up our entire list of online products for one week only!" Places of the Passion Week in 360-Degrees – Wayne Stiles shares some new photos. The sale of a Nebuchadnezzar II cylinder set a world auction record. iPad users can purchase the HebrewBible app here ($9.99). Happy 6th Blogiversary to BibleX! Leo Depuydt still believes that the “Gospel of Jesus’ Wife” is “hilarious” and “patently fake.” His article in the Harvard Theological Review is online as is Karen King’s response. Some excerpts are given in The Washington Post. Christianity Today runs an interview with Nicholas Perrin of Wheaton College about what it all means. A fascinating new exhibition will be opening next month at the British Museum on mummies and what we know about them from the latest technology. The changing graphic on the museum website provides a preview. This AP article has more details. Luxor Times has photos of antiquities recently stolen from the Luxor Temple. Barry Kemp has posted a report from the latest season of excavations of the Great Aten Temple in Amarna. King Tut began his US tour in Kansas City this week. He will be in San Diego in time for the annual meetings. The full list is here. The first two are particular favorites of mine. All 5 volumes of ZEB for only $34 is very good, though this resource may be more difficult to use in electronic format than in print form ($121). A faded fragment of papyrus known as the "Gospel of Jesus's Wife," which caused an uproar when unveiled by a Harvard Divinity School historian in 2012, has been tested by scientists who conclude in a journal published on Thursday that the ink and papyrus are very likely ancient, and not a modern forgery. Skepticism about the tiny scrap of papyrus has been fierce because it contained a phrase never before seen in any piece of Scripture: "Jesus said to them, 'My wife...' " Too convenient for some, it also contained the words "she will be able to be my disciple," a clause that inflamed the debate in some churches over whether women should be allowed to be priests. The full NYT article is here. The Harvard Theological Review article is available for free download here. On April 8, the Oriental Institute of the University of Chicago opened its new exhibit, "In Remembrance of Me: Feasting with the Dead in the Ancient Middle East." The centerpiece of the exhibit is (a cast of?) the Katumuwa Stele, a basalt monument with Aramaic inscription which was discovered at the site of Zincirli in 2008. The exhibit runs until next January. More information about the exhibit is online here. The catalog for the exhibit can be downloaded free in pdf format. The symposium is free and open to the public, but registration is required. Information about the symposium is here and online registration is here. Part of a burial site dating to the Late Bronze Age (thirteenth century BCE) was exposed in an excavation at the foot of Tel Shadud. According to the excavation directors, Dr. Edwin van den Brink, Dan Kirzner and Dr. Ron Be’eri of the Israel Antiquities Authority, “During the excavation we discovered a unique and rare find: a cylindrical clay coffin with an anthropoidal lid (a cover fashioned in the image of a person) surrounded by a variety of pottery consisting mainly of storage vessels for food, tableware, cultic vessels and animal bones. As was the custom, it seems these were used as offerings for the gods, and were also meant to provide the dead with sustenance in the afterlife.” The skeleton of an adult was found inside the clay coffin and next to it were buried pottery, a bronze dagger, bronze bowl and hammered pieces of bronze. “Since the vessels interred with the individual were produced locally”, the researchers say, “We assume the deceased was an official of Canaanite origin who was engaged in the service of the Egyptian government”. Another possibility is that the coffin belonged to a wealthy individual who imitated Egyptian funerary customs. The researchers add that so far only several anthropoidal coffins have been uncovered in the country. The last ones discovered were found at Deir el-Balah some fifty years ago. According to the archaeologists, “An ordinary person could not afford the purchase of such a coffin. It is obvious the deceased was a member of the local elite”. A rare artifact that was found next to the skeleton is an Egyptian scarab seal, encased in gold and affixed to a ring. The scarab was used to seal documents and objects. The name of the crown of Pharaoh Seti I, who ruled ancient Egypt in the thirteenth century BCE, appears on the seal. Seti I was the father of Ramses II, identified by some scholars as the pharaoh mentioned in the biblical story of the Israelites’ exodus from Egypt. Already in the first year of his reign (1294 BCE) a revolt broke out against Seti I in the Bet Sheʽan Valley. Seti conquered that region and established Egyptian rule in Canaan. Seti’s name on the seal symbolizes power and protection, or the strength of the god Ra – the Sun God – one of the most important deities in the Egyptian pantheon. The winged Uraeus (cobra), protector of the pharaoh’s name or of the sovereign himself, is clearly visible on the seal. The reference to the pharaoh Seti on the scarab found in the coffin aided the archaeologists in dating the time of the burial to the thirteenth century BCE – similar to the burials that were exposed at Deir el-Balah and Bet She‘an, which were Egyptian administrative centers. Tel Shadud preserves the biblical name ‘Sarid’ and the mound is often referred to as Tel Sarid. The tell is situated in the northern part of the Jezreel Valley, close to Kibbutz Sarid. The city is mentioned in the Bible in the context of the settlement of the Tribes of Israel. Sarid was included in the territory of the tribe of Zebulun and became a border city, as written in the Book of Joshua: “The third lot came up for the tribe of Zebulun, according to its families. And the territory of its inheritance reached as far as Sarid…” (Joshua 19:10). Tel Shadud is strategically and economically significant because of its location alongside important roads from the biblical period. The Israel Antiquities Authority is currently looking into the possibility of sampling the DNA from inside the coffin to see if the deceased was originally a Canaanite or an Egyptian person who was buried in Canaan. The full press release is here. High-resolution images are here. The story is also reported by the Jerusalem Post and Arutz-7. The clay coffin at the time of its discovery in the field. Photograph: Dan Kirzner, courtesy of the Israel Antiquities Authority. Parts of the coffin’s lid after an initial cleaning. Photograph: Clara Amit, courtesy of the Israel Antiquities Authority. A general view of the excavation area. Photograph: Skyview Company, courtesy of the Israel Antiquities Authority. Egyptian scarab encased in gold. Photograph: Clara Amit, courtesy of the Israel Antiquities Authority. The bronze dagger and bowl. Photograph: Clara Amit, courtesy of the Israel Antiquities Authority. His post also includes a number of interesting historical details about the city. For some interesting descriptions and illustrations of Tiberias in the 19th century, check out Life in the Holy Land. IAA Press Release: “An Impressive Byzantine Period Monastery with a Spectacular Mosaic Floor was Exposed at the Entrance to Hura in the Northern Negev.” The high-res photos are here. If you want to read just one review on the Noah movie, I’d recommend this one by Brian Mattson. Logos is offering a 9-volume set on the Archaeology of Rome. A new translation of the Tempest Stela suggests that the Thera eruption dates to the reign of pharaoh Ahmose. Haaretz: Ancient rock art is hidden all over the Negev. The Associated Press suggests five free things to do in Tel Aviv. On his recent trip to Israel, Wayne Stiles created 11 360-degree images of biblical sites. He also has recommendations on great resources to get after your trip to Israel. Byzantine period monastery at Hura. Photographs by Skyview Company, courtesy of the Israel Antiquities Authority. The Jerusalem Regional Planning and Building Committee approved the construction of a controversial visitors’ center for the City of David just outside the Old City walls. The committee heard objections to the huge project for eight hours before approving it Thursday evening. The proposal was submitted by the Elad association, the right-wing group that administers the City of David National Park, and the Israel Nature and Parks Authority, and has the support of the Jerusalem municipality. The plan calls for the construction of a museum, visitors’ center and auditorium in the area known as the Givati parking lot, some 20 meters from the Old City wall and 100 meters from the Western Wall. It will also constitute a new gateway to the City of David National Park. The building is to be 7 meters tall and cover 16,600 square meters. Beneath a planned parking lot, finds discovered at the site in recent years are to be preserved and made accessible. “The Jerusalem Regional [Planning] Committee heard the objections to the Kedem Center plan in Jerusalem and thought that the plan to build the visitors’ center will aid in exposing the important archeological finds to the broader public and serve as a focus for tourism that will help in developing the city of Jerusalem,” read the Interior Ministry’s announcement of the approval. The full article describes some of the objections and the planning committee’s requirements. The story is also reported by Arutz-7. Several months ago the Jerusalem Post reported the objections of a group of archaeologists, though the basis for their views seems to be primarily political and not archaeological. In reviewing previous stories posted on this blog, I see that a nearly identical story was reported in February 2012; it is not clear what is different this time around. For more images, see the Hebrew version of the Haaretz article. Proposed Kedem Center near City of David. The Jerusalem Post reports on the conclusion of excavations in the City of David around the Gihon Spring. Under the direction of Ronny Reich and Eli Shukrun, excavations were focused on the water systems of ancient Jerusalem for about 15 years. This brief article and accompanying video focuses on one aspect of the dig—the Canaanite fortress built over the spring. "The Spring Citadel was built in order to save and protect the water of the city from enemies coming to conquer it, as well as to protect the people going down to the spring to get water and bring it back up to the city," said Director of Development in the City of David, Oriya Dasberg. The citadel is believed to have protected the Gihon spring, described in the Book of Kings as the location of King Solomon's anointing. The Spring Citadel is the largest Canaanite fortress yet discovered in Israel, and is believed to be the largest known fortress pre-dating the reign of King Herod, according to the IAA. A two-minute video explains what they found and why it took so long. The best resource on the excavation is Ronny Reich’s Excavating the City of David. New excavations have begun on the eastern slope of the City of David under Tel Aviv University.